AlphaNinja - Good news in a bad sea. General Mills (GIS)updated the street on its just-completed fiscal year, adding that earnings should come in above the prior management guidance. Volume growth of 4% this year looks to be repeated in the 2010 fiscal year. As cost inflation slows, GIS will not raise prices further on its customer base. 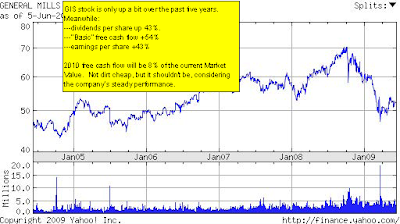 The company said it would provide more guidance on 2010 earnings on the July 1st conference call, but is comfortable (maybe the number is conservative) with estimates of $4.15 in earnings per share, giving the company a very tame Price/Earnings multiple of 13.